Looking for the best Dog Walking trails around Shelbyville? Find the top rated dog walking trails in Shelbyville, whether you're looking for an easy short dog walking trail or a long dog walking trail, you'll find what you're looking for. Click on a dog walking trail below to find trail descriptions, trail maps, photos, and reviews. Register for free with TrailLink today! We rode the Parklands section of this trail only. It is one of the most amazing trails I have ever ridden. While riding this part of the trail you don't feel like you are near the city. This is not a straight flat rail-trail. This is a purpose built trail that has sections with challenging hills, sharp curves, switchbacks and river bottoms. The scenery is beautiful and varied. There are rest stops and water at frequent intervals. The restrooms were clean and well kept. The trail links a series of parks. There is a little more congestion at the parks but people seemed courteous. The trail surface alternates between cement and asphalt sections. The cement parts are like giant sidewalks and are wide and smooth. The sections that go through hilly areas are mostly asphalt and also smooth and wide with the exception of a couple of small bridges that had large bumps at either end. The majority of road crossings are bridges or tunnels. A handful were on lightly traveled roads with part of those being at 4-way stops. All along the trail are separate hiking trails if you want to get off the bike for awhile. There are also areas to access the river for canoes and kayaks. Both the trail and river have mile markers. There are bike and boat rentals available at one of the parks. We ended up riding this trail end to end for several days straight because we enjoyed it so much. It is definitely a destination trail and worth a couple hours drive. When riding this trail you get the feeling that it is cared for by people who know they have a jewel and want to keep it that way. 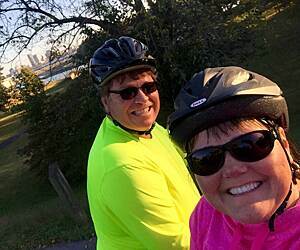 A day after riding the Ohio River Valley segment, we rode the Parklands out and back, starting at the north end. What a contrast! The Parklands is all perfect concrete, wide enough in most places to ride 3 abreast. Signage is frequent and at all turns. The trail covers both flat meadows and has some climbs, including a few hairpin turns. We saw a muskrat, juvenile bald eagle, red-tailed hawk and woodcock. Bathrooms and drinking fountains are frequent. So are signs about the area’s history and plant life. The organizations that designed and maintain the Parklands do a great job. We really enjoyed the ride. The Circle K gas station about 4 miles south of the start was the only place we saw by the trail for snacks and beverages. A friend and I rode most of the Ohio River Valley segment on a cool, sunny day in March. We parked by Eva Bardman and rode west and south, out and back. Pro’s: - historical signs downtown and in Shawnee and Chickasaw Parks - the parks themselves - riding past older houses in Shawnee and Chickasaw neighborhoods - great view up and down the River from the Big Four bridge Con’s: - lack of signage on the route, which goes from trail to road to trail .... Frequently you come to a turn or a T-intersection and have no idea which way to turn. Example: no sign to go north on Lee Lane. - downtown the trail winds around concrete pillars supporting the expressway. Hard to see (dim) and unmarked. - very few places to eat or get coffee close to the trail. I 'm not really sure that this this should be listed as a trail in its own right. This is really just an extension of the existing Legacy Trail. The signage along the trail actually designates it as the Legacy Trail. However, that should not be taken as a complaint. This portion represents another step toward bringing the Legacy Trail into downtown Lexington. I am hopeful that the other extensions will be coming soon. We split the Parklands of Floyds Fork trail section of the Loop into two days; arriving late Saturday we rode north from Pope Lick Park to Miles Garden, approx. 13 miles O&B. We unloaded at the park; a very safe & secure area with lots of cyclist. The north section of the trail starts out switching back uphill then meandering through a flat section to another uphill switchback section at the trailhead. We stayed the evening at an idyllically turreted B&B just east of the park and enjoyed a great meal at an upscale mussel & burger restaurant in Jeffersontown. On Sunday, we rode south to Broad Run Park, approx. 28 miles O&B. This south section of the trail starts out relatively flat but does gradually leads to more challenging grades (incredibly fun downhills). Make sure you stop at the overlook to view where you rode, the B-F Silo. Post ride lunch was at a great mac & pizza joint in downtown Jeffersontown. 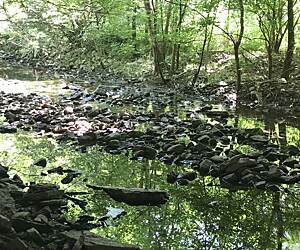 This is a beautiful, well maintained, multiple use (kayaking next) trail through park lands, creek sides and hilly woods. All of Louisville should be proud of this privately supported park and thanks for sharing with our family! Rode from Turkey Run trailhead all the way north to Beckley Creek Park. Agree completely with previous review by davemarshall. It's just beautiful and on a hot day the numerous shelters and water fountains are very welcome. To me, the only negative is that the trail is almost entirely concrete slabs, which means cracks between every slab. Every third or fourth one is wider than the others and so I really felt them as I rode over thousands of them. Many of those cracks have the remains of what looked to be a rubber-like padding, but they have deteriorated to the point of ineffectiveness now. Now, this may not even bother you and I did get used to it to some degree. And the faster you go, the less you'll feel them. But for me, it was the only drawback. Even if you think it might bother you somewhat, it shouldn't stop you from riding this beautiful, unique trail. I ride some portion of this incredible park system of trails 3-5 times a week and it’s never the same ride twice. The actual “Louisville Loop” is a proposed 100 mile trail around the city, but right now it’s more like three disconnected segments , each great in its own right. I’d estimate you can ride about 60 miles of it now. You can ride along the Ohio River on the Louisville waterfront and take the very cool Big Four Bridge across the Ohio River into Indiana and ride for 15-20 miles there as well. It’s big city but you don’t share the road with cars and it’s a great ride. 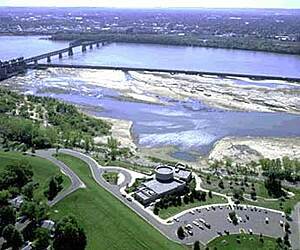 Amazing views of the river with restaurants, coffee shops and ice cream on the Indiana side. It’s cool to sit in the middle of the bridge with classical music being piped in! The next major portion open is along the west side along the Ohio River from the Farnsley Moreman House towards Louisville. The trail is flat, paved , with multiple rest areas along the way. 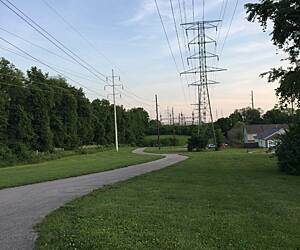 It’s often called the levee trail as it runs along the top of the levee! Mike Linnings is a local favorite fish place and it even has its own “off ramp”. 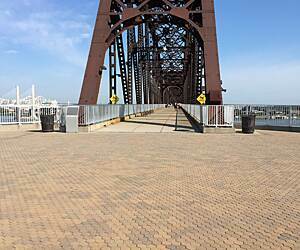 Great views of the Ohio River and very little traffic. 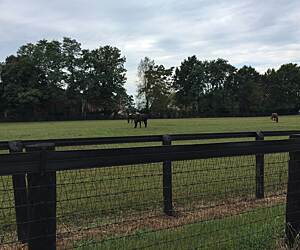 But the absolute jewel of the system that is worth a drive from anywhere in on the east coast or mid America is the portion called The Parklands. It’s a system of five separate parks, all connected with a wide, paved bike and pedestrian path. No cars to deal with. It covers every kind of terrain you could want, from very challenging hills, to pristine meadows, rolling hills, cool forests, river views, winding paths through cornfields and wildflowers everywhere. 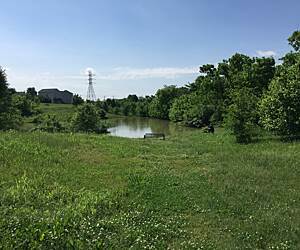 There are numerous access points but the trail runs from Shelbyville Road in the north (Beckley Creek Park) to Bardstown Road in the south (Broad Run Park). It’s a little over 40 miles round trip but quite a workout with some big hills near Broad Run. There are five segments, each with a trailhead, water, restrooms, picnic area and bike repair stations at most parking areas. From Beckley Creek it’s very scenic with rolling hills, meadows and a few decent hills. 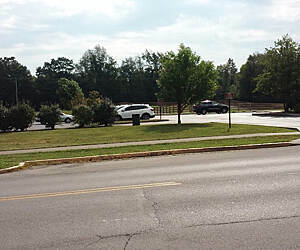 As you descend into Pope Lick Park, there are all the facilities you need. 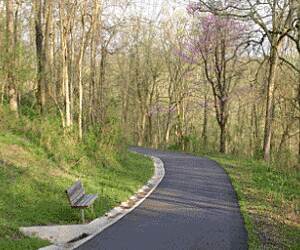 Heading out from Pope Lick is easily the most pristine and enjoyable part of the trail system. It’s called the Strand and is almost all flat following the river. Numerous bridges cross back and forth over Floyd’s Fork. It’s worth the drive alone. That part ends at Seatonville Road in Turkey Run Park. Restrooms and shade and water available. Leaving Seatonville you head up some challenging hills through the hills and woods of Kentucky and it’s absolutely gorgeous. More cool bridges await! You will come to the silo and another rest area in Turkey Run Park as well and if you have a hybrid or mountain bike they’ve just opened a mountain bike park right near the silo. You can climb the silo and get a birds eye view of it all. It’s great for the adventurer. There are several side trails, well marked for mountain or hybrid bikes to add some variety! The last portion goes from the silo to Broad Run Park, another hilly ride that flattens out at Broad Run Park with lots of bike options, including dirt paths along the river, paved paths through the meadow and a huge pavilion, spray park, picnic area and restrooms. 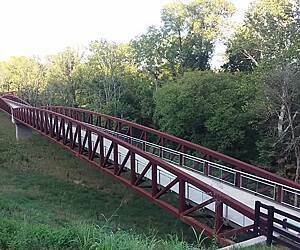 If you combine this with the levee trail and Ohio River portion it makes a great biking weekend! I’ve ridden the Silver Comet, Great Allegheny Passage, Monon Trail, Katy Rail Trail and The Little Miami trail and would put this up against any of them. Not nearly as long as those iconic rail trails but a GREAT bike experience! Very nice bike trail from the Kentucky Horse Park. wasn’t very well marked and we went the wrong way a couple to times. Will do it again and figure out what we did wrong. Some folks told us it went to downtown Lexington but we couldn’t figure out his to get there. Better luck next time! Beautiful country except parts of it run by the interstate and it’s noisy. This trail appears to be a good resource for the community. 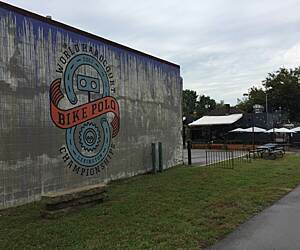 It provides (1) a safe place for children to ride their bikes separated from automobile traffic, (2) a place for those in the neighborhood to walk their dogs, and (3) a place for a leisurely stroll. It's too short for adult cycling or serious runners. If I lived in the neighborhood, I might use it often, but it is not something that anyone would travel a great distance to use. There is no public parking or trailhead. There are no magnificent views, unless you enjoy looking at power lines. We stopped off for a 10 mile out and back (20 miles total) starting from Beckely Creek Park and heading south/southwest. The trail was a nice wide concrete trail that follows the creek and winds it's way through a lot of different areas (housing, farm, parks,...). Given the many average reviews on this trail we almost skipped it, but are really happy we stopped. It was a cooler late October day on our way back to Minnesota and it turned out to be our last ride of the year. Not sure what the trail is like further along but this section is world class and worth a ride. Rode this trail on 30 Sep as part of the BourbonCountryBurn bike tour. Rode from KY Horse Park Campground to downtown Lexington. Trail is very well maintained. Has plenty of information markers along it about the surrounding area and it’s history. Takes you to many old restaurants in the Lexington area. Help us to connect you with more trails! TrailLink is a free service provided by Rails-to-Trails Conservancy (a non-profit) and we need your support!